In the most beautiful part of Sauternes where the most famous Sauternes châteaux lie, there’s a honey colored castle. 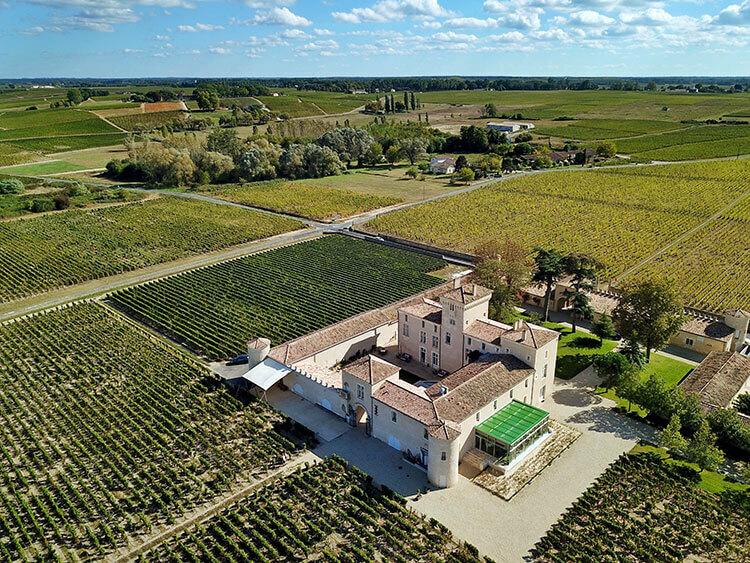 It’s Château Lafaurie-Peyraguey, one of the oldest château in Sauternes, and now a luxury boutique hotel and a gastronomic restaurant as well. Thomas Jefferson even bought wines from the château on his travels to Bordeaux in 1788. Come discover the wines, creative food pairings of a restaurant unspeakably good and stay for a few days in this stunning setting just 45 minutes from Bordeaux. Château Lafaurie-Peyraguey dates back to the 13th century when it was originally built as a fortress from the old stones of the nearby village of Bommes. The first known and recorded wine making activities began in 1618 when Sieur Raymond Peyraguey purchased the property and moved to Sauternes. As was the tradition in those days, he lent his name to the estate and it was called Château Peyraguey. The estate became Château Lafaurie-Peyraguey over a decade later when Pierre Lafaurie purchased the estate and added his own name to the label. He also expanded the estate, planting more vineyards. His efforts to establish the château with a reputation for excellence were rewarded when Château Lafaurie-Peyraguey was ranked in third place in the 1855 Classification of Sauternes and Barsac, just behind Château d’Yquem and Château La Tour Blanche. It’s a Premier Cru Classé, the second highest ranking after Château d’Yquem was so highly rated that it received its own ranking as Premier Cru Superieur. After the Lafaurie family, the château changed hands many times until a company called the Suez Group purchased it. By then, much restoration work was needed and they restored the estate to perfect condition. In 2014 Silvio Denz, a Swiss entrepreneur with a love of fine art and wine, purchased Château Lafaurie-Peyraguey. He had already purchased the French luxury crystal company Lalique in 2008 and owned other prominent vineyards in Bordeaux such as Château Faugères, as well as wine estates in other parts of France, in Spain and in Italy. With Silvio Denz’s purchase of Château Lafaurie-Peyraguey, the fine worlds of Sauternes wines and Lalique crystal have become intertwined. In 2018, in celebration of 400 years years of wine making, the château opened a boutique luxury hotel and a restaurant striving to earn a Michelin star. Of course, the wine is as exceptional as when it was ranked in the 1855 classification. Château Lafaurie-Peyraguey and Lalique are some of France’s oldest luxury brands. The estate itself is one of the oldest in Sauternes and Lalique dates back to 1885 when the first workshop opened in Paris. Since Silvio Denz took over the château in 2014, he’s intertwined the worlds of art and wine by placing the symbol of Lalique, the Femme et Raisins motif, on every bottle of Château Lafaurie-Peyraguey wine. The visit starts with a short video that plays at your emotions as the story of the Femme et Raisins is told. It’s more about Lalique than the wine, but it’s a beautiful video and seeing it first draws your attention to all of the ways Lalique is present throughout the estate. Of course, you’ve probably come for the wine and before long we’re in the vineyard. Sauternes is so special because there is no where else on earth where conditions come together to create a such a wine. We’ve timed our visit at the end of summer to witness the beginning of botrytis. It’s the fungus created by the micro-climate of the Garonne and Ceron Rivers, where warm and cool waters create a mist that washes over the grapes in the cool fall mornings. 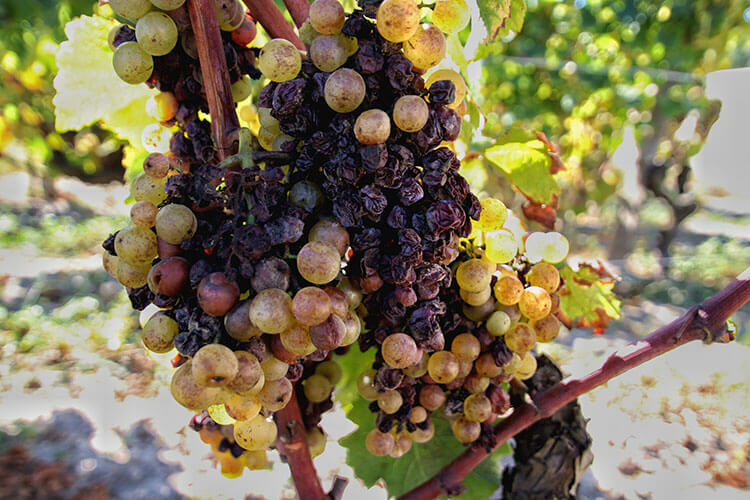 Also called noble rot, essentially the fungus dries the grapes up while highly concentrating the sugars in them. The grapes are hand harvested, not by the bunches like other Bordeaux wineries that also hand harvest, but quite literally picked one by one from the bunches. While the grapes may not look the most beautiful once botrytis sets in, magic is actually happening. And it’s essential to producing Sauternes wine. Not much is happening in the winery at this point in the summer, but we have a look at the vertical press and the tanks that will before too long be fermenting the this year’s vintage. Next we visit the small chapel, with the barrel room stretching out from both sides. A Lalique cross hangs over the altar of the chapel and it’s a piece of history that you’ll hear the story of. It’s so simple, it’s truly stunning. The classic visit ends back in the boutique with a tasting of three wines. The boutique also has every vintage since 1985 for sale, and it’s incredible to see the color transformation of the aging Sauternes. There’s also a selection of Lalique for sale in the boutique, as well as some specialties produced by the château like honey from their very own bee hives and Sauternes marmalades. A meal at Restaurant Lalique is more than a meal; it’s a gastronomic experience. And one you’ll savor the memory of for a long time to come. At the helm is chef Jérôme Schilling. He hails from France’s Alsace and his resume is impressive, working under top chefs such as Joël Robuchon and Roger Vergé. He uses fresh, seasonal ingredients. And he works alongside producers to only use France’s best ingredients, many of which come right here from the region like caviar from Aquitaine, Bazas beef and Marmande tomatoes. He also integrates the very essence of the vineyard in to his cooking, using grape must to tenderize meats and vine cuttings for the fire. You can order a la carte, or there are also several different tasting menus to select from. The menu changes seasonally and we’ve come just at the end of summer. We’re experiencing a tasting menu with wine pairings over lunch, which with the sun setting now before 7:30pm is the perfect time to come enjoy the stunning vineyard views from the 40-seat modern all-glass conservatory added on to the château. The simple elegance hides a lot of little surprises to be discovered, from the 120 gold crystal Semilion leaves decorating the ceiling to the carefully selected pieces for the table setting like the napkin rings encrusted with crystal grapes. But it’s the gastronomic experience that soon holds center stage. Lunch begins with what we called a Sauternes cocktail, the Sweetz. You can also try the signature drink in the bar. It’s not really a cocktail, but one of the many ways you’ll find Sauternes to be such a diverse wine. With just a little orange zest rubbed around the edge of the glass to flavor it, a little more orange zest in the glass, three beautiful ice cubes and Château Lafaurie-Peyraguey Sauternes poured over it, the wine is transformed. The Sweetz is served with the amuse-bouche, which is a work of gastronomic art. A porcelain plate that reminds us of a painter’s palette is placed atop the Femme et Raisins engraved bottles already set on the table. It’s a spectacular start, and the best is still yet to come. Cauliflower purée topped with Begula caviar in a vodka sauce that is ceremoniously poured by the waitstaff is the decadent first course. Like the Lalique crystal itself, even the food sparkles. It’s paired with Château Lafaurie-Peyraguey Bordeaux Blanc Sec 2015, a dry white wine that is a blend of Semilion and Sauvignon Blanc with a crisp freshness to it. 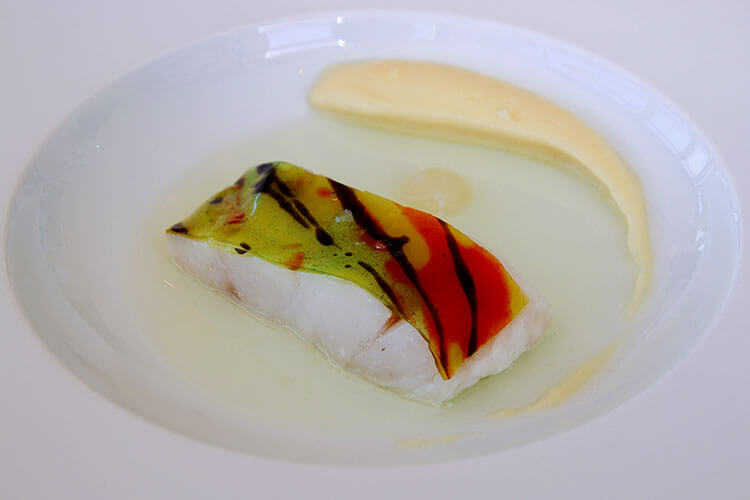 It’s hard to pick a favorite of all the courses, but if we had to it would be Restaurant Lalique’s signature dish: harlequin and bergamot sea bass with an elderflower vinaigrette. Sea bass has always been one of my favorite fish, since it’s a very meaty fish with a smooth, buttery taste for a white fish. The acidic flavors from the bergamot, which is like a sour orange or citrus flavor, are truly spectacular with the fish. It’s paired with a Sauternes that has been infused with elderflower, and the pairing is divine. Next, a black crusted veal filet with with green peas trompe l’œil. The wine pairing is Château Faugères 2008 Saint-Émilion Grand Cru from another of Silvio Denz’s properties here in Bordeaux. While we both normally would select a left bank when it comes to Bordeaux’s red wines, the 2008 is another delicious pairing that opens your mind to how to serve and enjoy the wines. The cheese course is another work of art. It’s 45-month aged Comté that has been cut into cubes and served with fresh herbs and croutons. It’s all topped with a fine lattice that looks like a honeycomb. A hibiscus infused Sauternes sauce is poured on to half of the plate with finesse. Cheese and Sauternes are a match made in heaven, and it’s paired with Château Lafaurie-Peyraguey 2010 Premier Cru Classé. One of the exceptional vintages of the estate, the 2010 is lush and balanced. We see it’s diversity as it’s also paired with the dessert course: summer fruits and an herb sorbet sparkling with gold leaf and topped with a white chocolate. Like Restaurant Lalique, the Hotel Château Lafaurie-Peyraguey also opened in 2018. The historic soul of the château was preserved, which is evident with the wooden beams in some of the rooms. The designers gave careful consideration to the furniture and decoration to compliment this space, and the Lalique Maison collection was created to furnish and accessorize it. Though Lalique is present in every piece, it’s an understated design. You feel cozy and right at home in liveable spaces. There’s just 13 rooms and suites in total, and each is decorated in the color themes you find in the vineyard: Bordeaux, golds and greens. The result is a relaxing space where you want to unwind and soak in the vineyard views. Even the superior rooms rooms are spacious, and there’s a variety of sitting areas throughout the château meant for guests to enjoy. Breakfast is also included with every stay. Guests are also offered bicycles, and there’s no shortage of Premier Cru Classé neighbors like Château de Rayne Vigneau and Château Sigalas Rabaud to also visit during your stay. Next year the hotel also plans to open a spa, the one thing we felt was currently missing from this sublime luxury hotel in Sauternes. It’s truly a place you can come spend a few days and feel a million miles away from bustling Bordeaux, while still being close to the city. Château Lafaurie-Peyraguey is best reached by car as there is no public transportation to the Sauternes area. Guests staying at the hotel can arrange airport pick-up and drop-off if you don’t wish to rent a car for an additional charge. 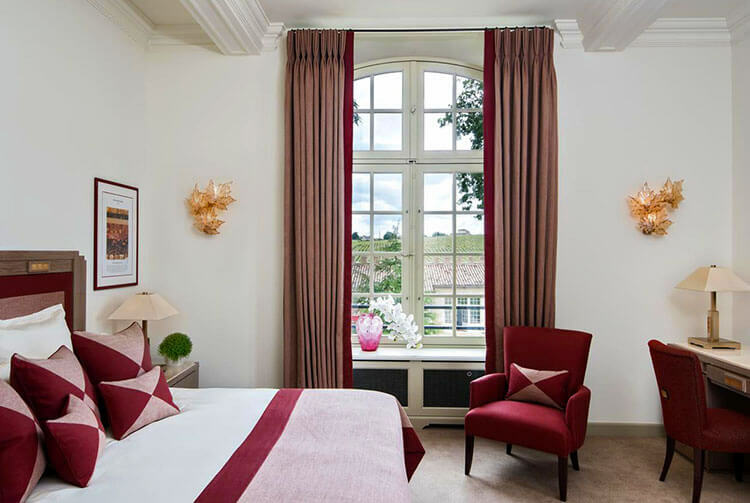 Hotel Château Lafaurie-Peyraguey by Lalique has a total of 13 rooms and suites, so it’s best to book well in advance. There’s free onsite parking and breakfast is included. Château Lafaurie-Peyraguey visits are by appointment only from Monday – Sunday from 10am – 6pm. Book your visit by emailing [email protected]. Restaurant Lalique is open for the lunch sitting from 12:30pm – 1:30pm and the dinner sitting from 7:30pm – 9:30pm. The restaurant is closed on Tuesdays and Wednesdays. Reservations required. We were guests of Château Lafaurie-Peyraguey in order to bring you this story. However, Luxe Adventure Traveler maintains full editorial control of the content published on this site. As always, all thoughts, opinions, and enthusiasm for travel are entirely our own. This article contains affiliate links. When you book on Booking.com through our affiliate site, we earn a small commission at no additional cost to you. What a place! You drew us in with the history and the region and that meal looks beyond decadent! Would love to someday get the opportunity to stay there and explore those vineyards (would also aim to be there to see the grapes with botrytis). Thanks for another incredible recommendation in Bordeaux! September/October is the time to visit if you want to see the botrytis! That meal, it is almost too beautiful to eat! Thank you for capturing this experience so perfectly. Stunningly beautiful and the dishes….chicken with sweet wine sorbet had me at the top and then it truly did just get better and better. Amazing!